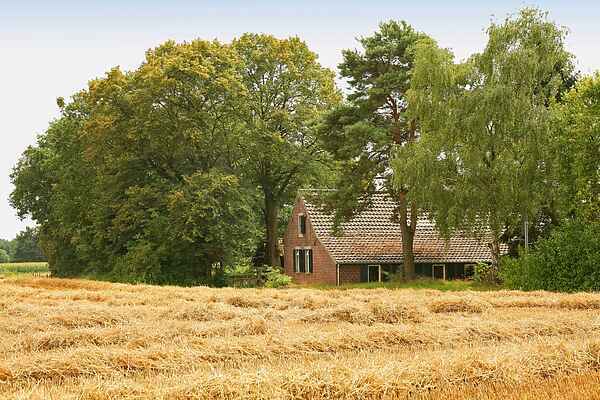 This 19th century farmhouse is a few hundred metres from the Belgian border and is surrounded by attractive countryside. It is two kilometres from the village of Stamproy in the Province of Limburg. The holiday home is in grounds of around three hectares. It is at the end of a metalled road and adjoins lush green woods and meadows. The area is tranquil and perfect for relaxation. Children can play to their hearts content. There is a large open space in the middle of the house and you can sit around an open fireplace. The immediate area is excellent for walking and cycling. There are many picturesque towns nearby such as Thorn and Maaseik which are well worth visiting. The famous IJzeren Man (Iron Man) recreation area is not far. Cats are not allowed in this farmhouse. Smoking ist only permitted at the chimney and in the kitchen. At winter period you need to take into account higher heating bills.